Golden Nugget Lake Charles | Cary Kopczynski & Company, Inc. 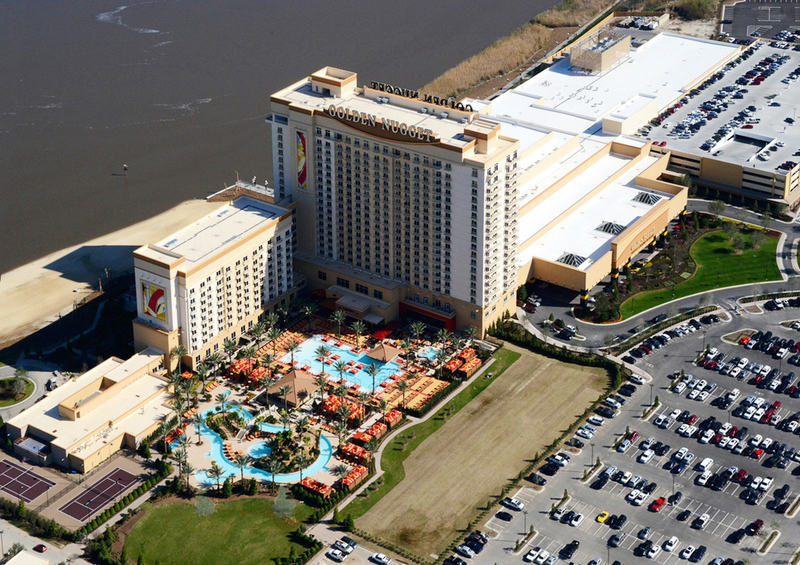 The Golden Nugget Hotel and Casino Resort is located at the riverfront of Lake Charles. This site consists of two hotel towers, a casino on floating foundations, spa, ballrooms, outdoor amenities and a parking structure. The hotel is composed of a 20-story tower and a 14-story tower. Amenities include a golf course, tennis, swimming pools, spa and fitness center, and restaurants. CKC studied several structural framing options and selected cast-in-place concrete system with post-tensioned slabs for the hotel towers and concrete shear walls to resist lateral loads. The casino and back of house structures were designed using long-span composite steel with steel bracing to resist wind loading. The native soils created a challenge for the project. The site had a high water table and was sitting on dredge spoils. The 220,000 square feet casino structure was designed on floating foundations. CKC worked closely with the geotechnical engineer and contractor to design the most efficient deep foundation system. A combination of 100 feet precast pre-stressed piles and steel piles were utilized on this project.